On 20 March the Annual Local Authority Road Maintenance (ALARM) survey 2018* was released highlighting the number of potholes on our roads. Lesley spoke to local BBC Radio Leeds about the impact for the road haulage fraternity. ‘More potholes mean more breakdowns mean more roadworks and more delays’ said Lesley. With an increase in online purchases very few deliveries begin and end on a motorway or trunk road. There is therefore a requirement for increased commitment to local roads as well as main roads. The road network is our industry’s place of work. Road conditions affect our ability to do our job well. The Asphalt Industry Alliance report claims that ‘one in five of local roads are now classed as structurally poor – with less than five years’ life remaining’. The long term strategy for roads must include traffic flow, signalling technology and information technology. President of the AA, Edmund King pointed out that responding to a Parliamentary question, Parliamentary Under-Secretary for Transport Jesse Norman revealed that four cyclists had been killed and 60 seriously injured in 2016 following accidents involving pothole and since 2007 defective road surfaces have contributed to 22 cyclist deaths and 368 serious injury incidents! 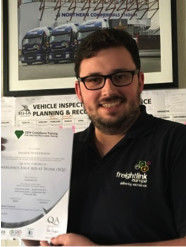 – On 7th March 2018 Freightlink Europe were pleased to see that they had coverage in their local newspaper about being accepted on the Earned Recognition pilot. This year Harrogate Ladies College celebrated 25 years and chose to mark the occasion by celebrating International Women’s Day and opening the college to a host of female business leaders. Lesley was invited to speak on the topic ‘How to survive in a male culture’. Lesley said, ‘I was invited to inspire, but was inspired by these very talented, passionate and confident girls who live a privileged existence. Nevertheless, like many other young girls they had little appreciation of the importance and potential in the transport industry. It is entirely this calibre of person that we need to reach out to if we want to fill our skills gap with talented and ambitious young people’. Joanne Harris of ‘Chocolat’ fame concluded the day with an interesting talk of how she achieved her success. Harris amused the girls by suggesting they ask awkward questions, stating ‘women who change the world ask awkward questions’, and not to be put off by rejection as ‘rejection was only a landmark on the road to success’. She continued to state that the girls should therefore be’ persistent in pursuing their goals’. Said Lesley,’ I think this is great advice not only for these young girls, but all women……I’m going to persistently asking awkward questions! From Monday 5 March 2018, DVSA traffic officers will start issuing on-the-spot fines for any drivers’ hours offences committed in the last 28 days. Officers will be able to issue fines for five offences in a single check. With fines of up to £300 for each offence a driver could be liable for £1,500 in a single stop whether the offences were committed in the UK or abroad. DVSA will also have the option to immobilise the vehicle. 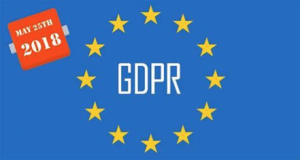 Are you prepared for the new GDPR regulations which come into force this May? 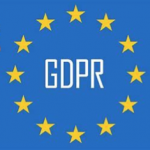 Proposed fines for failure to meet the deadline is said to be 4% of annual turnover to a maximum of 20 million euros. The current maximum fine is £500,000. We are considering organising a seminar to be delivered by a transport solicitor, specifically focussing what vehicle operators should do. If you are interested, please contact Nicola – Nicola@freightlinkeurope.co.uk. Following on from the seminar, the idea could be to have a forum of operators working together to assist one another. 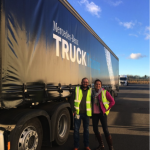 This month Lesley and Tom visited the prestigious Mercedes site in Barnsley, where they saw the latest Mercedes vehicles. In February we celebrated 100 years since women got the vote. Lesley was invited to speak on BBC Radio Leeds about the challenges of being a women working in transport. Earlier this month Lesley visited the large prestigious automated M & S distribution centre operated by XPO on the M606 industrial estate. We are delighted that XPO/M&S have kindly agreed to hold a She’s RHA event on 7 March, the event of International Women’s Day. This is an opportunity to visit the prestigious site and hear XPO employees discuss their career progression. Freightlink Europe is proud to be included in the list of operators announced today as part of the DVSA Earned Recognition pilot. Transport operators accepted on the pilot have not only had to show their commitment to safety and compliance with industry standards but have undergone an intensive audit to evidence their processes and procedures. There is an ongoing commitment to provide DVSA with information to meet KPIs, which if not maintained will result in the standard being revoked. Operators who have achieved this standard have been given a blue OCR score. We feel that the industry should embrace this as the only official standard which hopefully will be approved. 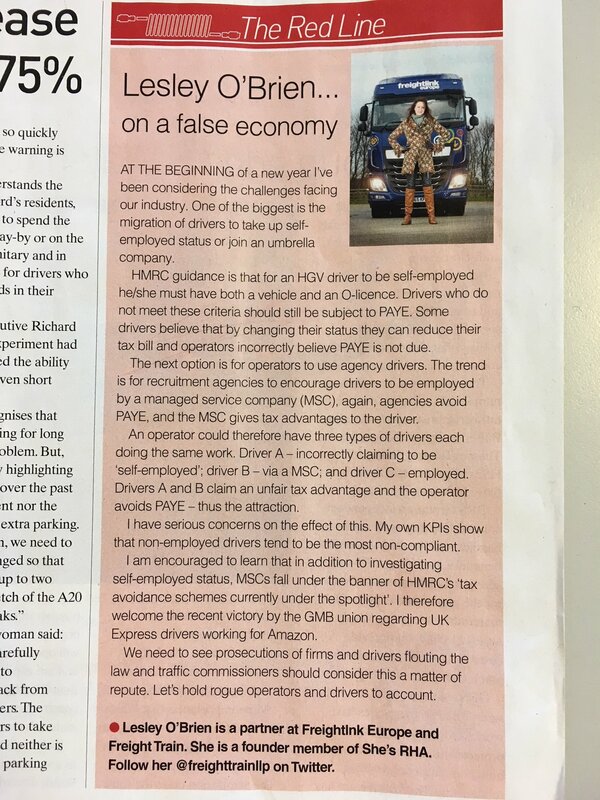 This is an opportunity for transport operators and DVSA to work together and drive out the non-compliant and rogues in our industry, who only serve to reduce profit margins, make our roads unsafe and give our industry a bad name. In January Lesley worked with the DWP to create a series of interviews. The aim was to help job centre staff to understand the needs of our industry and encourage young people and the unemployed to chose transport as a career choice. Lesley spoke about her experiences as a woman working in the transport and logistics centre. 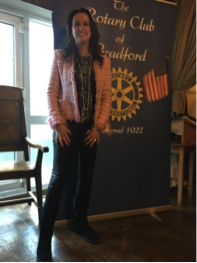 It was lovely to support my father and Bradford Rotary on Friday 8 December when I delivered a talk entitled ‘An introduction to the world of transport and the life of a woman in transport’. My father has been a member of Bradford rotary since I was a child. I am used to listening to him giving hilarious fabulous talks, so it was strange for the tables to be turned. We both had a tear in our eye as I paid homage the support my parents have given me – my father responsible for my business ethics, principles and teaching me how to barter! My mother the strong voice of defiance against the imposter syndrome, from which most women suffer! Did you know: Department of transport figures reveal that we are most influenced between the ages of 1 and 5 years old. Very few children will draw a woman when they are asked to draw a truck driver. Girls are influenced by their mothers and teachers to take up nurturing jobs such as nursing or teaching. For this reason only 8% of the transport and logistics industry workforce is female. In a bid to cut emissions Leeds City Council announced plans to charge trucks and taxis entering the Leeds Clean Air Zone (CAZ). The proposed tax for trucks is £100.00 per day for vehicles that do not meet the Euro V1 standard, to come into force in 2020. Given that small hauliers are the backbone of our economy and the average life cycle of a truck is 10 years, this could result in the closure of many small operators, who simply will not be able to afford new trucks , the cost to upgrade or the crippling fines. It most definitely will result in an increase in transport costs. Did you know: 90% of everything we eat, drink consume, comes on the back of a lorry? In 2015, HGVs accounted for just 10% of total NOx emissions. Between 2014 and the end of 2016, NOx emissions from HGVs reduced by a third. 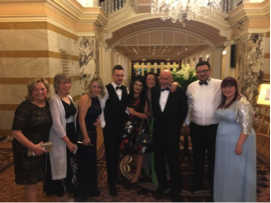 All work and no play, makes the Freightlink Europe team, dull and boring, so we donned our glad rags for the RHA dinner at The Majestic Hotel in Harrogate. 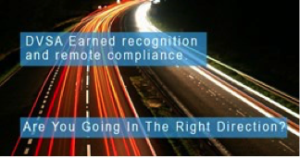 Industry is putting so much pressure on operators now to comply with a variety of standards, not without cost, that it is hard to know what to do – FORS, CLOCS and now Earned Recognition! 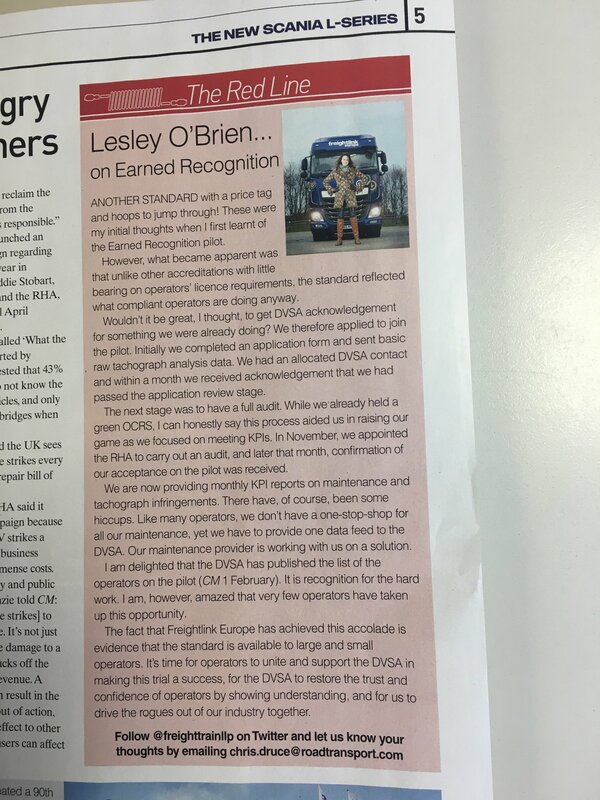 As opposed to FORS, which in my view focusses on documents and procedures, with no evidence of adherence to the same, Earned Recognition focusses on evidence of compliance with operators’ licence Undertakings. As Undertakings are linked to safety on our roads, this must be better for the transport industry, allowing the professional operators to get on with their work and the allowing the DVSA to focus on the serially and seriously non-compliant. It gets a thumbs up from me. A list of operators taking part in the earned recognition scheme shall be publish on the GOV.UK website in January 2018 DVSA confirmed that this decision has been taken in recognition of participating hauliers’ commitment to meet driver and vehicle standards. Well done to campaigners who have won the right for lorry drivers to use the toilets at non domestic premises. 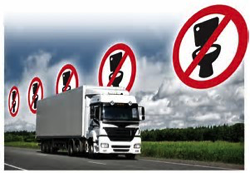 After it was widely reported that drivers had been refused access to welfare facilities at several major companies, the Health and Safety Executive finally reviewed its approach towards companies refusing to give HGV drivers toilet access. It is hard to believe that some companies were refusing drivers the basic right to use a toilet!! Did you know: DVSA carried out 223,000 roadside checks between April 2016 and March 2017. There was a 21% increase in the number of drivers found with manipulated tachographs compared to the previous year. 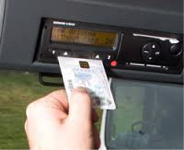 I feel passionate about exposing drivers/companies who flout the law, breach tachograph rules and use magnets to disable the tachograph. Not only is this unfair competition, but such companies/drivers are a danger on the road and bring our industry into disrepute. I was thrilled to be invited to the first ever Inspiring Women Changemaker Awards at the Aspir-igen centre in Bradford. The centre supports young people in their career choice and development. Food for the evening was prepared by young people looking for a career in catering and the Midland Hotel provided drinks upon arrival and post event drinks. I never cease to be impressed by the actions of young people and women who have come from humble beginnings. The awards were the brainchild of Anj Handa, a business woman, speaker and writer who is passionate about making positive social change. I was in awe of her and haven’t hesitated in connecting with her on LinkedIn to keep in touch. I’m looking forward to having a coffee together in the new year. Her current projects include working to end gender-based violence, including female genital mutilation and forced marriage. Well done Andrew for passing his Emergency First Aid at work level 3 course! Freightlink Europe decided to put all our office boys through emergency first aid. You never know when there could be an accident at work, when we need to look after one another.